Last week, July 4th, I left everyone alone to enjoy the bud light, firecrackers, and Ball Park hot dogs. I thought a lot about freedom. Independence Day. We are free. A lot of things are not perfect but we are free. I remember returning from a trip to a number of developing countries in college and then again from the Peace Corps in Togo and being suddenly reminded of how free we are. We are free to speak our mind. We are free to express our dissent through writing – free to put our names on it and not worry about violent retribution or loosing our livelihood. And importantly, as women, we are free. We are still a disgracefully small proportion of leadership roles. We arguably still live in a world where the rules of the game, social and political are written by men. BUT we are free to move to the big city or to a small farm in the middle of nowhere, to work, to marry or not marry, have children or not. We are free to complain about the rules of the game and put our name on it. We are free. I marveled at the fact that the Statue of Liberty – Lady Liberty, representing the Roman Goddess Libertas, is a woman. Freedom is a woman! (There are so few women that have been celebrated to mythical proportions throughout history that I will take this 150 foot hunk of copper as a victory). And she is no shrinking violet. She is not crawling around in a bikini. 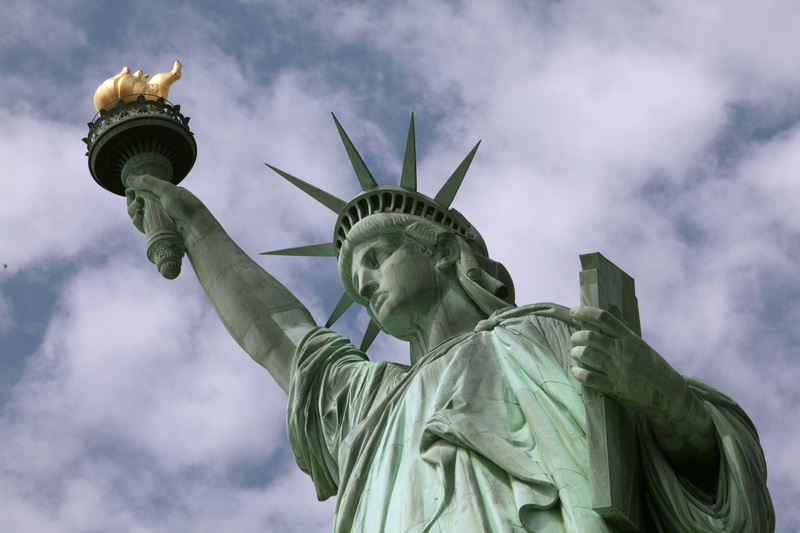 She stands proud and tall and welcomes people born in challenging places who are seeking freedom. Seeking a place where they are free to live, build lives and express themselves. It was a wonderful day to take a step back from all the turmoil in our news today and feel intense gratitude for this freedom and to remember how important it is for everything we value – equality, creativity, joy, expression, protection, diversity. What I am doing building a feminsty fashion brand for active, independent women, would not be possible in many parts of the world. It is nice to realize this when I slog through the day-to-day challenges. It may be difficult, but it is way easier to do here than almost anywhere else. We value freedom, independent choices, free expression through enterprise. And yet I also reflect on how freedom must be nurtured. Freedom needs expression. Freedom needs to be fought for. Our major news sources are failing us. Our democracy is floundering, purchased by the mega rich money addicts who have lost themselves and indeed us on their path to absurd wealth (great article on this here: For the Love of Money). If freedom is left without defenders, our structures to support its free expression crumble. It is only strong when it is exercised, built up, protected. Our duty as persons privileged to live in a country with a high degree of freedom: use that freedom. Nurture it. Express your creative truth even when lots of people might disagree with you. Without these actions, freedom will die. It is only as strong as its stewards.